Refurbishing your kitchen is a home improvement project that gives you the best value for your money. It increases the value of your home. But, more importantly, it becomes a better space for food preparation activities and for bonding among your family members and friends. The factors to consider when updating your kitchen include the layout, flooring, and storage. Other than these, you also have to consider the kitchen appliances. So, what can you do about them when you update your kitchen? Of course, one option you have is to buy new kitchen appliances. The advantage of buying new appliances is that you can replace the old ones with more energy efficient ones. But, apparently, buying new ones can be expensive. So, if you are on a budget, only replace the ones that you use all the time, such as the stove and oven. If you are not keen on replacing your appliances, one option you have is to paint them with appliance paint. This is more economical than buying new ones. However, its disadvantage is that paint may not work properly with heat. An alternative to painting your appliances is using peel and stick films. They can tolerate higher temperatures than paint. Another option you have if you do not wish to replace your appliances is to get replacement kits for them. With your refrigerator, for instance, you can just change the front and side with the help of a replacement kit. You can buy it for the model of your appliance. If you do not wish to paint or replace your old appliances, you can just fit them with wood paneling that looks just like the rest of the kitchen. This way, they would look like they are just part of the kitchen, so they do not stick out. To sum up, updating your kitchen may also mean updating your kitchen appliances. Does it mean that you have to replace them? Not necessarily. Yes, you may replace them, but if you do not have the budget for it or if you are going green, then there are other ways to update them. You can paint them with appliance paint or make use of peel and stick films. You can also take advantage of replacement kits if you wish to replace only certain parts of your appliances. Or, you can integrate your old appliances with the rest of the kitchen.  When updating your kitchen, you also need to consider updating your appliances.  The advantage of buying new appliances is that you can replace the old ones with more energy efficient ones. 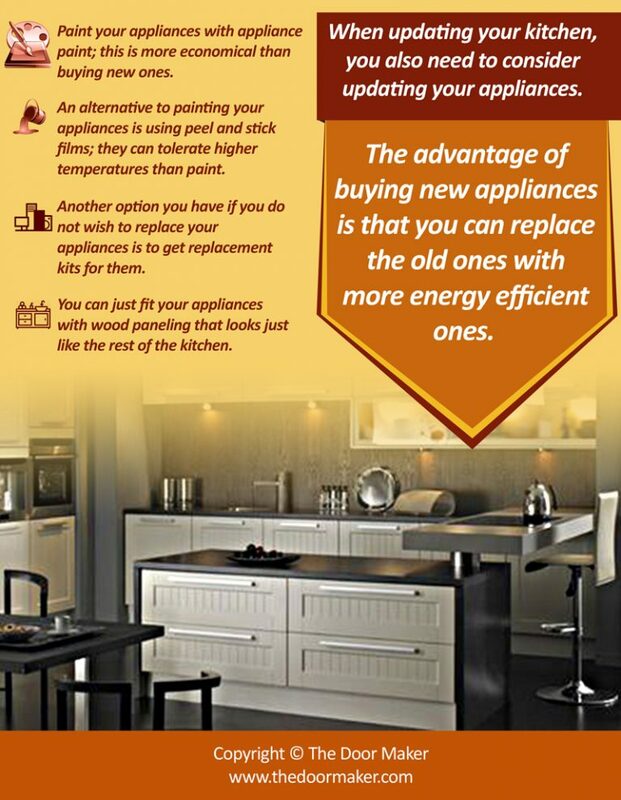  Paint your appliances with appliance paint; this is more economical than buying new ones.  An alternative to painting your appliances is using peel and stick films; they can tolerate higher temperatures than paint.  Another option you have if you do not wish to replace your appliances is to get replacement kits for them.  You can just fit your appliances with wood paneling that looks just like the rest of the kitchen.